We’re in that sweet spot when all your lawn needs to thrive is regular mowing and a whole lot of water. Summer is the time to enjoy your yard. 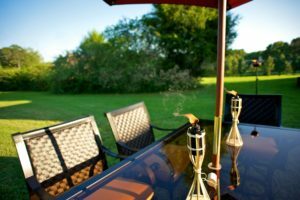 It’s the perfect season for backyard cookouts, lawn games with the kids, and evenings of relaxation. But to enjoy your yard in high summer, you have to put in the work during the rest of the year. Ensure your yard stays lush and healthy with Alternative Environments’ seasonal lawn care guide. Watch out for grubs. They go after your plants’ tender root systems in early summer. Adjust your mower blades to 3 inches and mow frequently. Manually remove any weeds that have slipped past your pre-emergent herbicides. Water deeply and infrequently to allow water to reach your lawn’s roots. Healthy lawns need about 1 inch of water per week. Water early in the morning or at sunset to minimize evaporation. Look for pooling water after summer storms. These indicate irrigation issues you’ll need to address in the future. Clean underneath your lawn mower once a month to prevent diseases from spreading. Patch any dead or bare areas in the yard. Keep the yard clear of debris. Aerate and overseed the lawn if you didn’t do so in the spring. Only fertilize the lawn early in the season. Fertilizing in late autumn jumpstarts growth just as the grass enters dormancy, which increases the risk of winter injury. Keep the lawn clean of debris. Minimize lawn traffic, which damages dormant grass. Don’t forget to water your lawn in the winter. It needs less moisture than it does in the summer, but the grass still needs adequate hydration. Sharpen mower blades. Dull blades will tear the grass, opening it up to further damage and disease. Tune your mower to ensure it runs smoothly all summer. Check your spark plug and air filter. Refill the gas. First drain old gas, which can get watered down and damage your mower’s engine. Clean up winter debris. This will help your lawn grow without dead patches. Apply pre-emergent herbicides to stop weeds before they sprout. Fertilize your lawn just before the start of growing season. Aerate and overseed your grass to keep it in peak health. Keeping your lawn healthy can take up a lot of time. If you’re too busy to care for your lawn, call Alternative Environments. We’ll schedule regular lawn service to keep your yard in great health all year.